Prehistoric Week: Looking Back At TERRA NOVA | Warped Factor - Words in the Key of Geek. Thinking back to Terra Nova I can't help but remember the excitement surrounding the announcement of the series. The name Steven Spielberg and the word "dinosaur", together they will always conjure up images of Jurassic Park, and so hearing the legendary filmmaker was to executive produce a new television series with dinosaurs, well the expectations were phenomenal. But, long before the show made it to the screen word got out that all was not well with Terra Nova. Production was delayed, budgets were skyrocketing and the premiere was postponed. The press, always keen to tear down anyone or anything that attempts greatness, were gleefully picking at Terra Nova's Jurassic carcass before the first dinosaur had roared into frame. And so it was with slightly less excitement that I sat down to watch the opening episode, expecting the worst but quietly hoping for the best. It didn't look like my hopes would be answered. The concept was not exactly Michael Crichton levels of storytelling. The show was centered around the Shannons, an ordinary 'all American' family from 2149 living on a dying Earth, who are transported back 85 million years to join Terra Nova, a colony of humans with a second chance to build a civilisation. Despite the budget the CGI wasn't great, it wasn't bad but not really what I'd hoped for. Worse, though, in that opening episode it felt that almost all the cast were forgettable, or, in the case of the youngsters, annoying. Essentially I was getting the feeling that Terra Nova was nothing but trashy, pulpy TV for the masses. Which of course it is, there's no denying that, but Terra Nova proved to have just the right ingredients to stay on the acceptable side of the entertainment line without drifting too far into absolute cheese fest. I made it through the pilot, and even found myself warming up to it a bit. By the second episode, I was hooked. The concept may have been derivative, but it was addictive. Forget Jurassic Park and seeing dinosaurs alive in the 1990s, here was a tiny colony of humans living in the midst of the Jurassic period. It's guns vs dinosaurs! The sets were mighty impressive, and Terra Nova itself looked great. 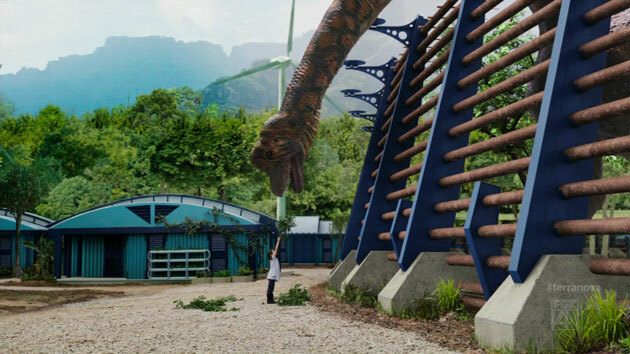 It was clear that set-design was zapping a lot of the budget, rather than it all going on the CGI dinosaurs, and that, I think, turned out to be the better decision. 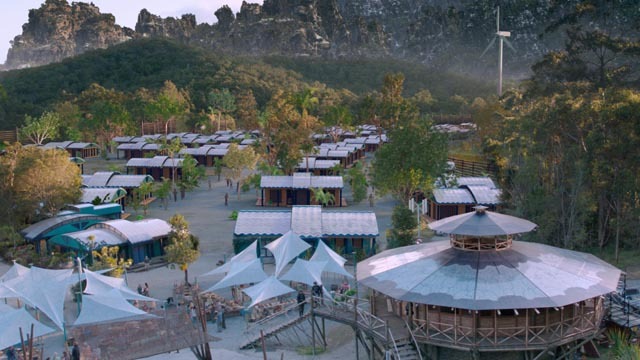 Plus as the show was filmed in Australia the sets were built surrounded by actual vegetation from the rainforest, making it look even more realistic. Episode plots were remarkably good. I loved the attack of the swarming flying creatures, a really unexpected kind of menace. The big story arc with the rival colonists could have been tedious beyond belief, but it was somehow steered into entertaining twists instead of painfully obvious and frustrating ones. Even the characters started to develop and grow on me. Jason O'Mara, who I'd written off in that first installment, turned out to be a good leading man, but he was not the real star of this series. Stephen Lang, as the tough-as-nails commander, was the standout, obviously. It's amazing how one really solid actor can anchor an entire show, and Lang does it beautifully in Terra Nova. The show was worth watching just for his presence. 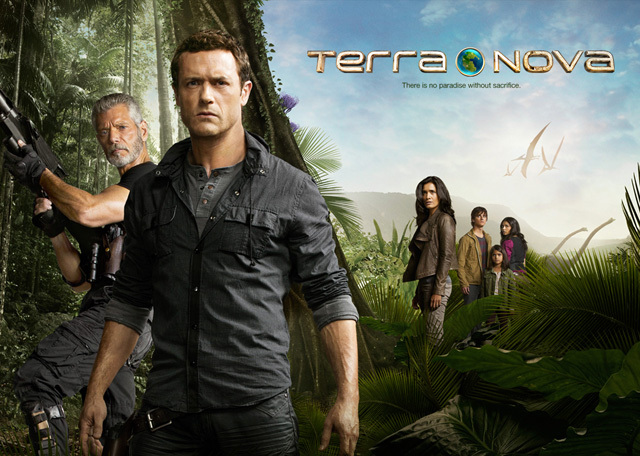 By the end of the first season I was getting really caught up in the weird world of Terra Nova. At that point, of course, cancellation became an inevitability. The show got to wrap up some of its plot threads, but left some of the more intriguing ones dangling (were they really back in time or in the future?). There really should be a law against this kind of thing, I've been burnt too many times thanks to too many premature cancellations. All in all, Terra Nova was most definitely not a work of genius (it's more akin in style to Jurassic Park 2 than Jurassic Park 1), but I believe that what it set out to do it did well enough. It may have been a bit of a weak concept and featured some suspect acting here and there (and some unremarkable dialogue) but somehow it worked. Somehow this romp through primordial jungles became addictive viewing. Somehow it all came together and added up to something that was really.... not bad. Not bad at all.